As some of you may know, in France people usually serve a Christmas log to close a traditional dinner made with seafood, poultry, smoked salmon and/or foie gras. As we live abroad, we usually celebrate Christmas only the four of us. I decided that in contrast with previous years, we will not have Christmas log for days. 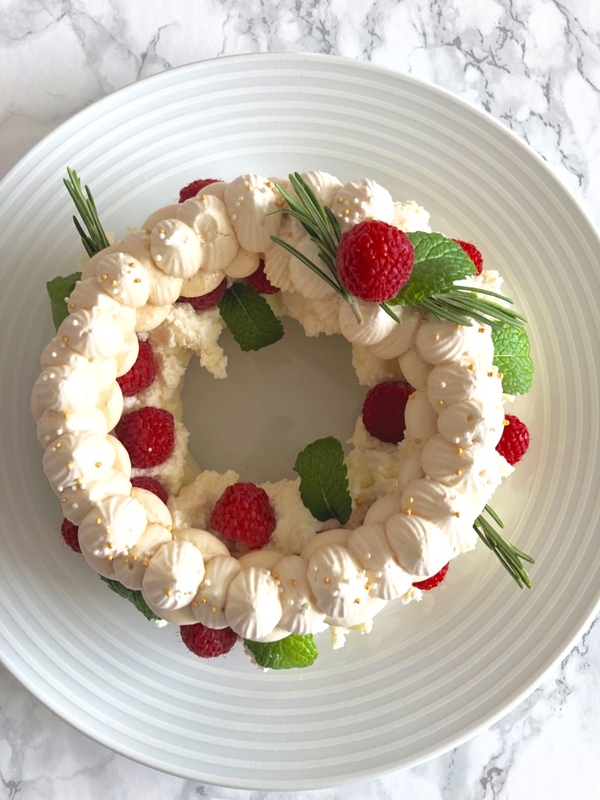 So I decided to make a small pavlova instead and it was just perfect. 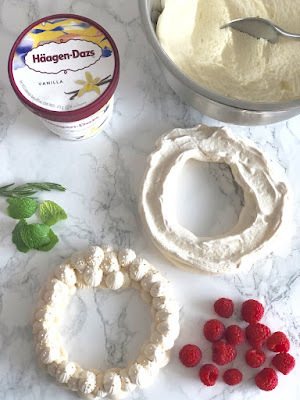 I just added some vanilla ice cream which makes it look like a vacherin, one of my husband's favorite dessert. A vacherin is a pavlova with ice cream, as simple as that. 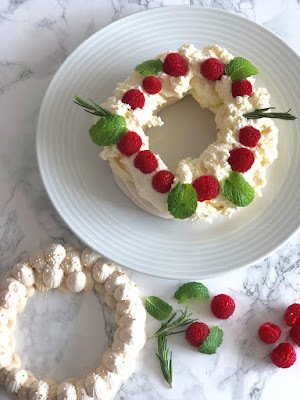 If you are looking for a festive, easy and beautiful dessert, search no more. Add the egg whites in a mixer and the lemon juice. Mix at high speed until the egg whites start to foam and hold shape, add the granulated sugar at three times while still mixing. Add the rose water or any flavor of your preference and keep mixing for a good 10 mn. Then add the confectioner sugar at once and gently stir in with a silicone spatula. Dry the meringues at 130°/150°C - normally meringues are to be dried up at 100°C but I have a gas oven that always turns off at less than 150°C so annoying - for 2 to 3 hours. Melt the white chocolate au bain-marie with 50 g of heavy cream. Transfer the whipped cream in a salad bowl and cover and let it sit in the fridge. It will hold, do not worry. This whipped cream recipe is also perfect to cover sponge cake. It's aerated, light but has great coverage ) not speaking of foundation. Serve straight away and enjoy!! I hope you'll give it a try. Let me know in the comment if you do.